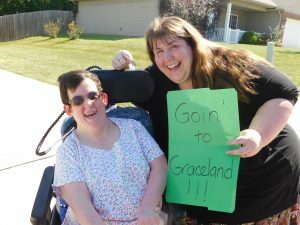 Crystal and Carrie share their excitement about going to Graceland! Her family members are huge Elvis Presley fans. Naturally, Crystal has always wanted to visit Graceland. Recent family losses intensified the draw Crystal felt to make her pilgrimage. During a three-month period last year, Crystal lost both her grandmother and younger brother, Jeremy. They would have loved to visit Memphis. When she started receiving services through ACT, Crystal voiced her desire, her dream to head south. But she also shared her doubts. She had accessibility concerns. She uses an electric wheelchair and requires other assistance and equipment. Carrie saw the challenge. But she was determined not to let it stand in the way. “You shouldn’t limit yourself. If you really want to make that trip, I’m sure we’ll be able to find a way to get there,” she told Crystal. Crystal and Carrie discussed in detail each of the potential obstacles and how they could be overcome. Crystal moved forward and planned the trip herself, while Carrie facilitated her choices. One of her complications was financial. She had the funds to make the trip happen herself, but couldn’t afford to pay for staff. Carrie applied for funding out of ACT’s CoMoGives donations. Her request was granted. Carrie now had the means to accompany Crystal on her dream journey. Crystal and Carrie searched for accessible hotels, restaurants, and places of interest. They called the hotel to confirm there was a roll-in shower. And they booked connecting rooms so Crystal could have support and privacy. Crystal wears a shirt with a picture of her brother, Jeremy. In addition to the usual items one would pack for a trip like this (clothes and toiletries), Carried needed to bring along a Hoyer lift, a shower chair, battery chargers for the lift, and more. Carrie worried they would have to rent a small trailer. With a little creative maneuvering, they were able to pack it into an accessible van. They were then concerned there might be an equipment malfunction or that something unexpected would happen so far from home. So they invited John, who also works at ACT. The last step in Crystal’s plan was to design a custom t-shirt displaying a picture of her brother. She planned to wear it on the trip so he could be there too. Then it happened. Planning turned into action. They were at Graceland! 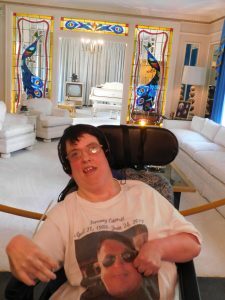 Crystal was surprised at how normal Graceland seemed in comparison to the lavish mansions today’s celebrities have. She liked Elvis’ pool. She ate peanut butter and banana ice cream in memory of the King—made exclusively for Graceland by Prairie Farms. She learned about his twin. She even met a woman who claimed to have dated Elvis back in 1975. What really stood out was the way people spoke to her personally, not her staff. Sometimes people see her and assume she can’t communicate. Not so. Crystal likes to speak for herself. Two people saw her shirt and asked about it. That gave her opportunities to talk about her brother Jeremy and share his memory. Crystal explored other areas of Memphis, too. She stopped at a casino and prank called her mom to tell her she had gambled all her money away! She said the casino looked just like what she imagined Las Vegas to be. One evening, she ate dinner at Marlowe’s, a destination ribs restaurant. 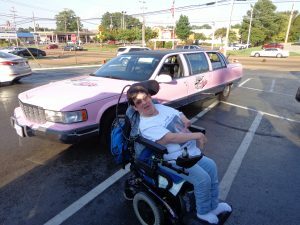 Paying homage to Elvis, they make their food deliveries in pink Cadillacs. Crystal had made it to Graceland. Experiencing her dream brought real tears to her eyes. 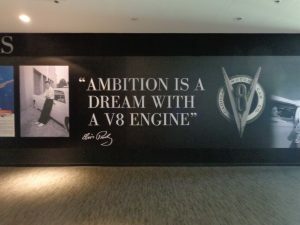 “Ambition is a dream with a V8 engine.” That’s the Elvis quote Crystal saw as she was touring the auto museum. When she saw it, she said, “ain’t that the truth.” Then Carrie captured the moment with a photograph.